As per statistics, it is been said that out of every 100 people at least 1 suffers from some kind of autism disorder, it can be Asperger’s syndrome or any other disorder related to autism. Autism was not very common earlier, but in recent times this term has been heard more and more as the number of people suffering from this syndrome is increasing every year. Though the percentage of such people is nearly 1%, it can not be neglected. People with Asperger’s which is an Autism Spectrum Disorder (ASD) lack a little in social skills when compared to normal people. So, it is very important that they work on their other skills and make use of their strengths. Now, do you think, the people suffering from Asperger’s syndrome find it difficult to get a job? Not really, as the job opportunities for such people are getting vast. Employment be it for any, provides a sense of purpose, a pride to accomplish something regarding career growth and development. Though the sufferers of autism might find it difficult in the initial stages, with a little skill and smart strategies it is something which can be possible. Also, autistic people, hold many valuable skills that most employers look for. According to Notable autism activist Temple Grandin, following is a list of jobs that could be a perfect fit for people suffering from autism syndrome, based on their thinking style and verbal ability. 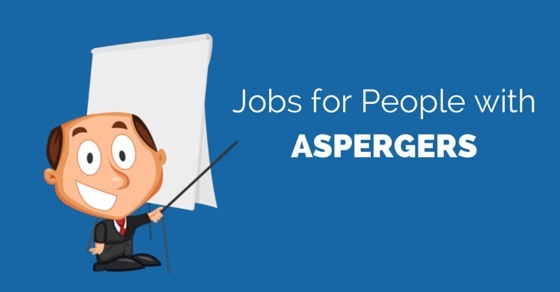 Here is a list of some of the good jobs for people with Aspergers which are differentiated into three sections based on the skills they possess. Becoming a photographer is an ideal job for any visual thinker even those who happen to suffer from Asperger’s syndrome. In this case, being a still photographer or videographer would be a better option if the individual does not have very well developed motor skills to move around briskly. This is indeed a well paying and rewarding jobs where he or she can simply sell the beautiful pictures to any magazine, online page or even to a company that could use the pictures on their calendar. Though people with this syndrome might find it tough to communicate their thoughts and ideas to other people, very often they are able to develop wonderful bonds with animals especially dogs as well as cats. Keeping this in mind, they could always take up jobs as animal trainers as well as jobs where they can take care of other’s pets when their owners are at work or on vacation. Such jobs are indeed relaxing, fun as well as extremely well paying! Making handicrafts is an art which not many people can perfect. However, people with this talent are often exceptional when it comes to doing things with their hands. They are able to create wonderful handicraft materials like jewelry, handkerchiefs, cards, decorative pots, as well as little curios and there, is an immense demand for these kinds of products across the world. So they are bound to be able to earn quite a good wage for their breathtaking work. You can take up this job even if your communication skills and short-term memory is not very well developed. To be a good painter, you need to have neither of those two qualifications so therefore it would make for an excellent job with anyone who has Aspergers. Often, what people with Aspergers cannot express via their words or deeds they convey via their art and painting. Hardly anyone in the world could say that he or she does not like music. It is most likely that a person with this syndrome would be unable to play an instrument like a piano or a guitar owing his or her poor motor skills but the ability to sing well can reside in anyone. People with his syndrome might love to work and interact with children on a daily basis as their singing teachers. Lastly, one of the best jobs that anyone with this syndrome could embark on is opening a vocational training center where he or she could do the wonderful task of helping others who have Aspergers and do not have the confidence to work in offices or companies. Video game design and web page design. The only trait requires for this job is that you need to be simply excellent with numbers. What they may be lacking in other areas they surely make up for in this field. So this is one career path they are sure to be able to manage provided that the job is not very demanding and the company hiring realizes that though these are individuals with low social skills they more than make up for that with their work. This is one of the best careers for Aspergers. As opposed to a job as a cashier who has to be able to think fast and make changes quickly, a bank teller has the task of counting money in an accurate manner so that no mistakes are made in bank transactions. Since this is a job that is not very stressful and demands that the person performs the same task over and over again without making use of his or her short-term memory, it makes for the perfect job for anyone with this syndrome. Individuals with this syndrome do not have a highly developed short-term memory causing them to be incapable of doing any tasks that involve them to revise things, multi-task or take quick instructions. However, when it comes to jobs where they have to do the same thing over and over again and make use of the knowledge they have in their long-term memory they prove to be absolutely invaluable so therefore they can easily go in for a job as the clerk. This is one of the good jobs for aspies. Whether it is a job as a librarian or as a person employed to restock the books shelves, having this kind of job is ideal for an Asperger’s patient. As we all know, in a library everyone is expected to keep conversations to an absolute minimum so whether the person can communicate well or not does not mean anything. All that the individual will have to do is make sure that the task that he or she is employed for has been done well. So if you suffer from Aspergers or if you know a friend or family member who does then this is a career option that he or she can most certainly take up as it is a task that is repetitive and does not involve much social interaction. Almost on a daily basis people constantly need to get papers printed out or even need to have photocopies made, so it is needless to say that this is most certainly a good as well as a lucrative job option for anyone with Aspergers. Having Asperger’s syndrome does not mean that the person is incapable of doing any task or has to be confined to the house at all times. Many people make the mistake of not allowing their loved ones with the syndrome to work and this does affect him or her adversely because as time passes by, he or she begins to feel useless. Even a job at a retail store, involving him or her to restock empty shelves could most certainly give the person involved a sense of importance and identity. Gardening is both an art as well as a science. It requires people to be able to have some knowledge in plant care as well as an ability to create beauty using natural things like flowers, mud, shrubs, climbers, and creepers. This is a job that requires hours of concentration and hard work. However, if the individual has an interest in gardening then it will certainly be wonderful to watch him feel at one with nature and feel capable of creating beauty out of simple things. This is one of the good jobs for Aspergers. No highly stressful job like waitressing, baking or bartending could ever be suitable for a person with this syndrome as this job requires speed, precision as well as plenty of social skills. However, for jobs like buying of the raw materials, stocking the fridges and pantry as well as other simple repetitive tasks like running the salad bar or even slicing and chopping things are tasks a person with this syndrome could indeed be ideal for. In recent years people have really begun to look into the needs of Mother Earth so as to ensure that the future generations are able to enjoy the resources of the earth just as we do. So due to this reason across the world, there are various recycling plants that have come up so that recyclable material like plastic and glasses can be made use of instead of disposing of it. For recycling plants there is a lot of labor required for sorting waste, so individuals with this syndrome could do this job of sorting well and efficiently. Warehouse or factory jobs might be too repetitive and boring for the likes of many but they are absolutely perfect for individuals with this syndrome who are unable to deal with change well. So whether the job involves loading and offloading trucks or ensuring the finished products meet company standards, this is indeed an ideal job for any person with Aspergers. So there are indeed a number of jobs for Aspergers adults to choose from. They are hyper-focused on things which interest them. However, at all times he or she must ensure that he is not entering into a field where there is a lot of stress and constant pressure where there is too much dependence on the short-term memory. Previous articleWhy am I not Getting Promoted at Work?